Rugby have a very strong vets squad and usually do well in the England O40s cup, and this game was a week ahead of their next cup match, so some practice they wanted.... 9 times at it turned out with no response, but we all go back for a beer afterwards..... that is all except Steve Lycett who does go back but decides the beer is better all over the floor for some reason...most unusual for Steve! 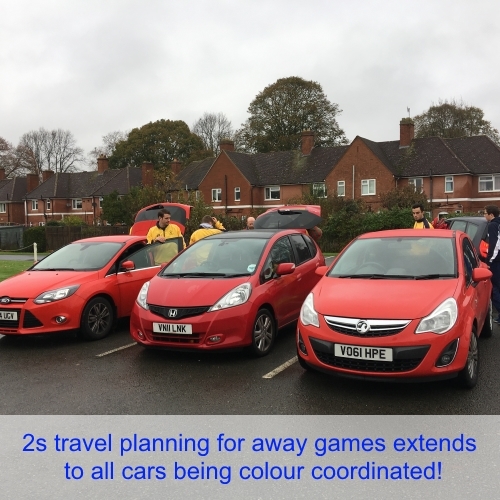 Helen writes "A disappointing 0-2 loss for Warwick this week, which doesn't reflect the improvement and commitment everyone has put in so far this season. The great escape starts next week against 7th place Kettering". Langers (senior) was on hand at the club house to witness the entertaining 'who will be the latest to arrive?' contest won by Alp Shaw with an outstanding 15min + late arrival. This was followed by more entertainment with the 'who's driving this week?' debate. Ange writes "Travelling with only 11 to unbeaten Hampton who are currently top goalscorers on the leagues was always going to be tough. But everyone dug deep and held them to only 3 goals. Another losss but we fight on". Langers reports "What could have been a win when with 5 minutes to go Wes Payne hit the bar from about 1m out, but we will take the 2-2 draw against a well organised Bournville side". Nick keeps it brief "Poorly performing Warwick 4s lost 6-2 away to Worcester 5s". Coach Andy Griffin reports "In fairness the L4s 1-1 draw is a good result. Against a side 3rd in the league they bossed the first half and we're only denied 3 points by the opposition kicking their goal in! Even their bench didn't think it should have been given. Moral victory and winnable games in the next three weeks." Claudio sent in "Warwick 5ths Lost 5-1 to Daventry Saints or Northampton 4ths . considering the opposition should probably be two divisions higher it was a gallant effort and a standard Steve Lycett short corner was the only consolation goal. Apparently we were their toughest match so far!"